Suzie, welcome to Romance Lives Forever! Tell us about your latest book, including its genre. Does it cross over to other genres? If so, what are they? My publisher listed it as Romantic Suspense and as erotica. Maybe it’s me, but I never considered it either of those. The focus is on the couple more than anything else, and while I don’t close the bedroom door, I don’t think it’s any hotter than, say, one of Toni Blake’s main stream romances. It certain doesn’t come close to Emma Holly’s eroticas. In my mind, my stories are romantic comedies. That’s kind of scary to admit, because I feel like I’ve just opened myself up to people saying it’s not funny. The most important part is that I have fun with what I’m writing. If it’s not fun for me to write, I know it won’t be fun for the reader to read. Aside from the having fun part mentioned above, I love hearing from readers. Writing is a solitary activity (except, of course, for the people in my head), so when people tell me they enjoyed it and my characters came to life for them, I’m delighted. I could get seriously addicted to that. I usually start with characters in a situation. Except for knowing where the characters will end up (together, of course; this is romance after all), I don’t plot much. Writing is a journey of discovery for me. That’s what keeps it fun and interesting. I’m constantly asking myself, “What next?” keeping in mind that it had better be fun. Two? I have to narrow this down to two? Okay. I reread Jennifer Crusie’s early romances about once a year. She’s laugh out loud funny to me, even after the first time. I also love Toni Blake’s books. They’re hot and, if you look closely, she sneaks serious themes into some of her books. So far, there’s only one: A Knight in Cowboy Boots. In November, Knight of Hearts is being release. I still recommend A Knight in Cowboy Boots first though, because while the stories can stand alone, they are interrelated. 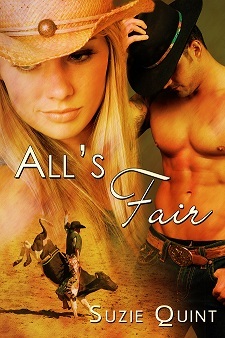 I’m also have a short(ish) story called All’s Fair that ties into the McKnight series available in ebook format. I’d love to give nice, fluffy answers to this. Things like “hope” and “optimism.” There’s some truth in those answers, but they’re too stock to make me happy. I’ve noticed an underlying theme in my writing. I’m fascinated with how family shapes you into the person you become. It would be lovely if all families were happy, supportive, and functional, but they’re not. God knows mine wasn’t. (Not that they were terrible, but I have my share of tics that I can trace right back to the loving family nest.) What I hope people take away from my work as a whole is to be grateful for the good, supportive people in your life whether they’re blood kin or family you’ve chosen to adopt. If you’re in toxic relationships, you can change that. Surround yourself with people who will be there for you, as Maddie does in A Knight in Cowboy Boots. She learns the lesson that you can’t do it all on your own and that having people who will stand with you is priceless. I want that for all of us. Spain. The Costa del Sol, preferably. I think a country isn’t civilized unless they have siestas. For a lot of years, it would have been On the Road Again. For now, since I’m just starting to get published, I guess it could be New Kid in Town. I’d be a grammar checker. In fact, people do use me for that in my day job all the time. They’re constantly asking me to proof something they’ve written. A music store. Someplace that sold a lot of ballads. What is the one question you wish an interviewer would ask you? I have no idea. Sometimes the simplest seeming questions pull out the most interesting answers. Dogs or cats? Cats. Absolutely cats. I’m always ready for lobster. You’d never be able to tell, but I actually have shy moments . If I could win the lottery I’d write full time and never retire. I can never skydive because I’m terrified of heights. Romance Lives Forever welcomes Storm Moon Press to the blog! Today and the next two days, we’ll host authors and anthologies from this publisher. Grab something to drink and make yourself comfortable. Here we go! Anthologies are a great way for authors to get a taste of working with a new publisher, or for readers to try out several authors who are new to them. They’re a grab bag of fiction with a strong binding theme between the stories, and it can also give authors and readers a chance to try themes they usually avoid. Anthologies have so much potential, and I think they tend to be overlooked in favor of longer, broader works. There are unique challenges to editing and producing anthologies. Usually, the publisher themselves takes a financial hit when producing them. Many readers wait for the individual shorts to be released, and while a publisher could refuse to do this and try to force readers to buy the anthology itself, I think this alienates readers and loses authors potential revenue. Still, selling an anthology to readers is a hard task, but we don’t give up. Anthologies are fun, creative endeavors that are great opportunities for publishers, authors, and readers. But, because there isn’t a lot of money to be made in anthologies, a lot of authors shun submitting to them. This makes it hard to drum up the numbers a publisher needs in order to create a solid offering for readers. Authors—both established and new—should see anthologies as chances to connect with publishers and readers without having to commit whole novels. Anthologies are opportunities to connect with new readers, and since readers are the bread and butter of the book industry, reaching even one new reader should make the investment in a short story worth it. I’ll be honest; promoting anthologies is hard as hell. A lot of reviewers don’t want to review anthologies, waiting instead until individual stories are released. There aren’t many venues to gush about anthologies. The key is to have themes that are either broad enough to appeal to a lot of people, or so niche that the only place readers will find stories of that kind are in the press’ anthology. Storm Moon Press tries to work from both angles, appealing to both wide tastes and narrow fetishes. In the end, anthologies are singular opportunities for authors and readers to reach each other with minimal expense, effort, and time. They’re full of quick reads, all sharing a singular theme, and—usually—for a minimal cost. So, go out and pick up an anthology, give a new theme or group of authors a chance, and authors? Check out anthology calls and give a new press a try with a short story. You might just find yourselves with new favorite authors or a new press to submit regularly to.